Wesleyan’s Office of Student Affairs placed posters throughout campus featuring a 'Halloween Checklist' to help students determine whether their costume ideas might be offensive. The posters include several general questions that students are encouraged to ask themselves before settling on a costume. Now that Columbus Day is over, Wesleyan University is turning its attention toward the next controversial date on the calendar: Halloween. Wesleyan’s Office of Student Affairs has placed posters throughout campus, an example of which was obtained by Inside Higher Ed, featuring a “Halloween Checklist” to help students determine whether their costume ideas might be offensive. An employee at the Office of Residential Life informed Campus Reform that the poster was spearheaded by the Student Activities and Leadership Development office, but calls to that department had not been returned by press time. 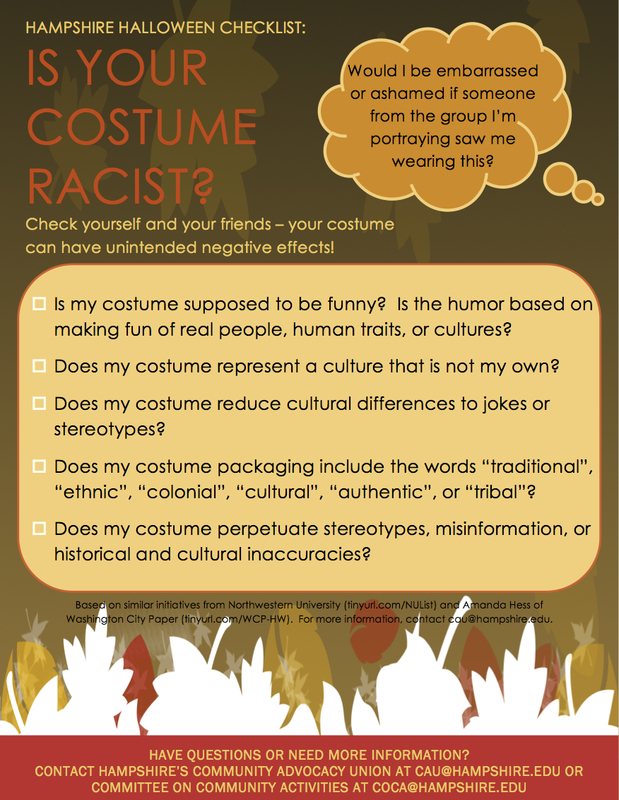 Hampshire’s version of the poster, while similar to Wesleyan’s, places a greater emphasis on racial and cultural sensitivities without specifically mentioning any other groups that might be subject to offense, and also offers students a sort of broad-based litmus test for evaluating their costume choices. The Northwestern checklist, according to Color Lines, was articulated in 2010 by then-Dean of Students Burgwell Howard in a letter to students prompted by the previous year’s controversy involving two students who attended a party in blackface. The other source for Hamilton’s, and indirectly Wesleyan’s, posters comes from an article in the Washington City Paper that was published just before the 2009 blackface incident at Northwestern, in which blogger Amanda Hess offers advice on confronting individuals who are unaware of the offensive nature of their Halloween costumes. Astute readers of the Inside Higher Ed article, however, observed in the comments section that Wesleyan’s proscriptions encompass a variety of costumes that would be unlikely to set off alarm bells. “Would a costume consisting of a Brooks Brothers button down shirt, LL Bean khakis, a loosely knotted Vineyard Vines tie, no socks, and Sperry Topsiders offend anyone?” another asks.